Pre-Terminated Fibre Optic Cable - The widest range of pre-term fibre cables available to configure and order online with free delivery. 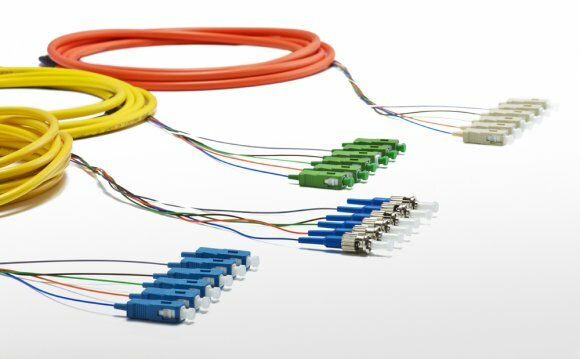 The Universal range includes MPO / MTP high density fibre assemblies for data centres plus LC, SC, ST indoor / outdoor backbone cables. Benefits of Pre-Terminated Fibre Pre-term fibre cables allow fibre optic networks to be installed in a fraction of the time taken by conventional on-site direct termination or fusion splicing. Pre-terminated fibre cables are more cost effective than traditional methods as installation costs are lower. Cables are made to order in the exact specification and length required, factory tested and terminated and delivered to site ready for installation. Applications - Pre-term cables are popular for any application where performance, scalability and quick installation are important factors. Product Options - Options are available for standard fibre cable or armoured fibre cable, between 4 and 24 fibre core, in multi mode fibre, OM1, OM2, OM3 & OM4, and single mode fibre, OS1, standards. Connector options are LC, SC, ST, FC & E2000. Would you like further information on pre-terminated fibre optic cables? Click on the images below to view the relevant product categories. If you'd like to speak to someone about your requirements, call us on 00.